Mark Donohue Jr. trademark was his versatility. He raced and won in sports cars, Indy Cars, stock cars; on both oval tracks and road courses. He was a two-time USRRC Champion, a three-time SCCA Trans-Am Champion, a Can-Am Champion, winner of the 24 Hours of Daytona, the Indianapolis 500 and a NASCAR Winston Cup race at Riverside, California. Donohue was born on March 18th, 1937 in Haddon Township, New Jersey, one of three children to a prosperous family. Mark's father was a lawyer who married Mark's mother, Hazel Wright in 1934. The family moved to Summit, New Jersey where Mark grew up. By the age of 15 he had his first car, a 1937 "convertible" without fenders. In 1959 he graduated from Brown University with a bachelor's degree in mechanical engineering. While a student at Brown University, Donohue had his eyes set on a British or simi liar European sports car like his close friends but his father thought otherwise and helped him buy a more "sensible" Corvette with which the young Donohue later entered and won a hillclimb at Belknap, New Hampshire. Eventually he would sell the Corvette to buy a Elva Courier which would allow Donohue to compete in SCCA's F-Production class. In the mean time he was attending night school and working at Raybestos. Competing with the Elva now "graduated" to F-Production brought him into contact with a Morgan driver by the name of Peter Revson. Donohue would with that year's championship, the same year that Roger Penske won the next class higher, D-Production. He began to make a name for himself racing sports cars becoming Class champion in the SCCA sportscar championship of 1961. Winning his first National race in 1964 driving Jack Griffith's Cobra. That same year he drove an ex-Walt Hansgen MGB to victory at Bridgehampton, NY. Under the mentorship of Hansgen Donohue competed in his first major endurance race, driving a Ferrari 275 at the 12 Hours of Sebring. In 1965 he was a double SCCA Class champion winning in Formula C driving a Lotus 20 and in GT Production with a Shelby Cobra. With Hansgen's continued support he signed a deal to drive a Ford GT40 in a few International Endurance races. It was in 1966 during testing for the 24 Hours of Le Mans that his early mentor Walt Hansgen was killed. While attending Hangsen's funeral he met Roger Penske who offered Donohue a race-by-race contract for the upcoming USRRC and Can-Am series races. The Penske partnership developed into a strong bond between the two men not unlike the bond between Clark and Chapman or Stewart and Tyrrell. Unbeknownst to Donohue at the time his current team owner John Mecom "sold" Donohue to Penske who was free to offer him contract. Donohue driving a Lola-Chevrolet, won three Can-Am races that year and finished second in the final standings. In 1967, he swept six of eight races to win the USRRC crown and repeated as its champion a year later. In 1968 and 1969 Donohue and Penske Racing claimed the Trans-Am crown. For the 1970 season, the Penske team switched to the AMC Javelin. This was quite a departure for Penske who owned several Chevrolet dealerships but personal strains had developed between their racing department boss, Vince Piggins and Penske. It was also felt that his organization was not getting the credit that it deserved. Taking over the existing Javelin team Donohue and Penske soon realized that they needed to build a new car and race team from scratch and should not expect a lot of help from the factory beyond the $2 million budget. Penske was determined to beat the Camaros in Trans-Am and by 1971, Donohue dominated the competition winning 8 out of 10 races to capture the Trans-Am championship. In 1973, Donohue drove an American Motors Matador with which he won the season-opening Winston Western 500 on the road course at Riverside, California. giving American Motors its first NASCAR win. Bobby Allison would win another four stock car races for American Motors. At the start of the 1969 season Donohue along with Chuck Parsons win the 24-Hours of Daytona driving a Lola T70 Coupe for Roger Penske. Later that year Mark Donohue went to the Indianapolis 500 for the first time and was named rookie of the Year with a strong fourth-place finish. The next year Donohue finished 2nd to Al Unser Sr who dominated the race. In 1971, he became the first man to top 180mph in qualifying at Indy with a speed of 185.004 mph, but mechanical problems put him out of the race on lap 67, having led the first 50 laps of the race. He returned to Indy in 1972 and won with an average speed of 163.465 mph, leading the last 13 laps. It was also McLaren's and Roger Penske's first victory at Indianapolis, a race for which he would become famous through his 16 wins at the 500-mile classic. A broken piston put Donohue out of the race in 1973, the last Indy 500 that he would compete in. Blocked from purchasing a current McLaren M8B for the 1969 season Penske decided to stay away from the Can-Am series until they could field something a little more competitive. That car was the Porsche 917K/10 which they raced and won the championship in 1972 with George Follmer. For what should have been a title season for Donohue was ruined by a crash and a badly broken leg prior to the race at Road Atlanta. Donohue was able to come back at the end of the year but by then his championship hopes were over. The following year, 1973 proved to be the high-point of Donohue's racing career when he became Can-Am champion driving the awesome Sunoco Porsche 917/30, which Donohue played the primary role in developing, to 6 wins out of 8 races. This twin-turbocharged unlimited blue and yellow monster is considered by many as the fastest race car ever built. 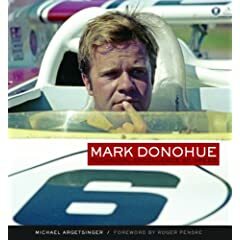 In 1974, Mark Donohue took a year off at the pinnacle of his driving career to write “The Unfair Advantage”, a plain-spoken, insider’s look at the world of automobile racing. The book tracks his rise from amateur races in Mustangs and Corvettes to winning the Indy 500 in Penske’s McLaren M16 and is considered one of the best biographies ever penned by a driver. Coaxed out of retirement in 1975 by his long-time employer and friend, Roger Penske, he joined his fellow American on the Formula One circuit. They had raced earlier in Formula One, Donohue finished third in the 1971 Canadian Grand Prix, but this was a new car built at Penske's British base in Poole, part of a stronger effort or so it seemed but while practicing for Austrian GP, a tire thought to have deflated, pitched his car into the catch fencing and vaulting over the barrier, killing a marshal and injuring another. Donohue's helmet struck one of the fence post and he was momentarily knocked unconscious but otherwise apparently unharmed, he continued to complain of headaches and later lapsed into unconsciousness, dying two days later in a Graz hospital, despite undergoing emergency brain surgery. One year later Penske would win in Austria but at a different circuit in a car driven by John Watson. Penske was the last American entrant to win a Formula 1 race. It would be easy to regret Donohue coming out of retirement but it was clear to many that he had retired too early and was not happy just playing the role of General Manager within the Penske organization. To a generation of fans in the 1960s and 1970s, Mark Donohue embodied a new, uniquely American spirit in motor racing. Donohue was not only blindingly fast he was also smart, with a background in engineering and a unique talent for studying and setting up a race car. Together with his like-minded team owner, Roger Penske, he brought a new level of technical sophistication and preparation to nearly every type of American racing, from sports cars to the Indianapolis 500. In the first full biography of Mark Donohue, author Michael Argetsinger tells the story of racing's ultimate driver-engineer, one who set the standard for generations to come. He also explains how Donohue's life and career were shaped by his friends, family, and fellow drivers, as well as by the rapid changes in technology and competition that swept through racing during his time.